I watched ‘Congo’ this weekend because I remember reading a bit of the book after reading Jurassic Park and thought well maybe the film is pretty good, never seeing a trailer, never read any reviews so I had no clue what was actually coming. Never before have I seen a film that is both terrible and at the same time gives so much to talk about, normally a bad film is boring or lacks good story telling and so there’s not much to say but not with this film there is plenty. This is a summary so will quickly go through my thought and then you can read my more in depth thoughts. 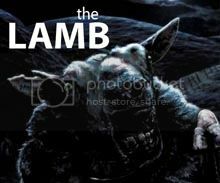 Story, never before has loosely based on the book been so true. Acting was surprisingly bad considering some of the stars. 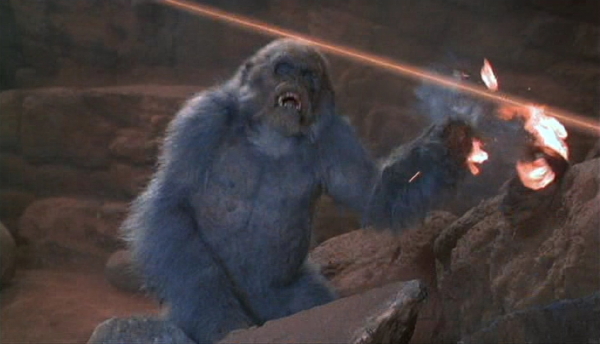 Visuals were terrible in general but mainly those ‘Bad Gorillas’ were just awful! Dialogue, best lines came from a gorilla using sign language. Shock/Thrill/Fun, we shall have none of it in our film! Style/Sound, no style and the soundtrack seemed a little random to me. Characters, they seemed to only have cheap lines and scenes that suited the story, most of the characters have about one line in the whole film and absolutely nothing memorable. R.B. Travis (Joe Don Baker) is the ruthless head of Travi-Com, a telecommunications firm on the cusp of a major breakthrough in laser communications technology. However, Travis needs diamonds to finish the project, so he sends a group of men to Zaire, where he’s told that a large supply of the gems can be easily found. When the men go missing, Travis sends his trusted assistant Karen Ross (Laura Linney), a one-time CIA associate, into the jungle to find both his staff and the jewels. Hoping to keep her mission a secret, Karen travels to Zaire in the company of Peter (Dylan Walsh), a researcher on primate development who is hoping to return Amy, a gorilla who has been taught sign language and can “speak” English with the help of a glove-controlled computer device. Also travelling with them is Herkermer (Tim Curry), a Romanian with a secret agenda: he’s convinced that Amy can guide him to the Lost City of Zinj, where he believes that King Solomon’s Mines are located. Upon arrival, the group is met by Monroe Kelly (Ernie Hudson), a self-described “great white hunter who happens to be black,” and they discover that the jungle holds a menace that they weren’t counting on: a tribe of bloodthirsty gray gorillas. Tim’s Film Reviews Not Recommended. Terrible! Funny, But Terrible! To start off let’s talk about the acting. The acting in this film was bad, not sure why but my guess is they didn’t try from the beginning because I have seen films where most the cast have done some fantastic acting. On the other hand maybe they were directed terrible or their characters where written terrible, not sure but somebody failed big time on this film. So who do we have that surprised me in terms of being bad, Dylan Walsh, Laura Linney, Ernie Hudson and Tim Curry, I have seen all of these actors do good stuff so why this did they all turn off. For example Tim Curry, defuq happened?! I mean he isn’t always an amazing actor but his characters are always fun, I am afraid that isn’t true of this one. On the story side of things it is based off a good book which managed to succeed in bring thrills and the sci-Fi stories Michael Crichton normally bring to the table, however the film loses contact with its roots and starts to balls the whole thing up. It’s the storytelling I mainly had a problem with as the story is essentially the same as the book with a few changes (for the worst). So now let’s talk about the visuals. The Visual Effects in this film were pretty terrible, mainly though it was how they used rubbish effects and props but displayed them too much to shock or thrill anything like in the book. The gorillas where ok but when you see them too much e.g. the Sign language gorilla then they look awful, the worst however would have to be the ‘Bad Gorillas’. In the book it is concluded the animals are not “true” gorillas by modern biological standards, but presumably a gorilla-chimpanzee or gorilla-human hybrid: their mass and height is closer to humans than gorillas, their skull is greatly malformed (the “ridge” that makes gorilla heads look “pointy” is nearly nonexistent) as well as their pigmentation is on the border of albinism: light gray fur and yellow eyes. Nothing other than the grey fur is the same and that annoys me, plus they never do an autopsy which I love in films where they study the mystery creature. The intelligence and the way the book described the story is completely missing in this film and it’s a real shame. Maybe there will be a better adaptation in a couple of years. The best reviews I have found would be these “Feels as if the picture were edited to leave the action sequences in while removing any connecting material that might have helped them make sense.” Brian Lowry. If you have seen the film then it makes sense, none of the scenes work together at all. Also “The entire tone of the book has been transformed from tension to tongue-in-cheek with dismal results.” Kenneth Turan. Terribly idea for any film adaptation, changing from a Jurassic Park style thriller to a comic mess isn’t a good idea. Lastly this one just makes me laugh” Watch the opening for Bruce Campbell’s death scene, and then run far away.” Rob Vaux. Haha that’s very good advice, I thought it was going to be good when I saw the eye in his hand but then it really wasn’t What’s my favourite scene? I don’t have one the film was terrible and good night. This movie is awful! 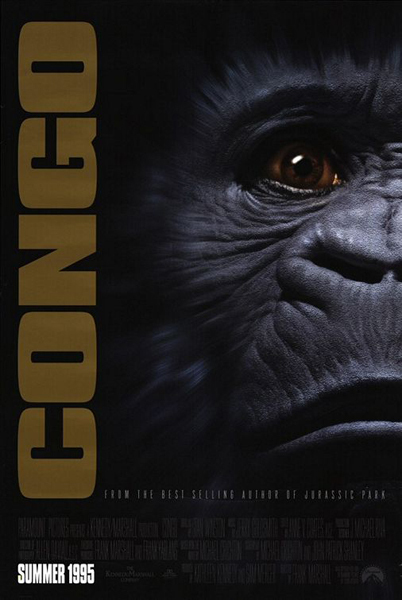 I feel bad though because I love Michael Crichton’s work, but Congo as a film adaptation is pretty bad. Been a while since I’ve seen this one. I’m not sure I want to revisit it now. I didn’t remember it being this bad. Yeah, I remember reading this book ages ago and thought similarly. This could have been a thrilling movie, but wasn’t. Fine look at this, Tim. I recall either an old cover or ad for this book, but I swear its image of the character Munro looked like Tom Selleck (who, back then, would have been great casting, if they stayed with the original story). This is an example of Hollywood taking a perfectly good book and destroying everything that made it good. The sad thing is that it was directed by Frank Marshall, who previously made the not-excellent but pretty good “Alive” and “Arachnophobia.” This was his last directorial effort before returning to producing duties. He’s an excellent producer, and needs to remain as such. Exactly i am not sure why everybody did terrible in this film, none of them has been a bad actor or director so why was this so bad? Why?! Actually, I enjoyed Ernie Hudson’s performance, which was like a beam of light in the gloom. Never watched this one but I’m glad I read your review–it was fun.